A friend posted a photo of this soup on Facebook. It looked good, so I asked her to post the recipe and last night cooked up a pot for Ditalini and me. It didn’t take long to make, maybe half an hour to get the meatballs ready, maybe 20 minutes for the rest. It was delicious. The cinnamon and sweet potato give it a flavor I hadn’t encountered before … different in a delightful way. This recipe will definitely become a regular on the deMenthe menu! Heat 2 tsp oil over medium in a pot. Cook onions until they become soft, season with salt & pepper. Add garlic, cumin, and cinnamon and mix well with a spatula. Transfer all to a mixing bowl and add beef. 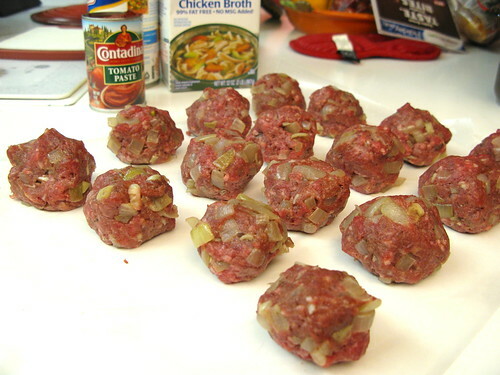 Using your hands, gently mix and shape into balls. Put meatballs on waxed paper until later. Add another 2 tsp oil to the pot and heat over medium-high. Add sweet potatoes and carrots and cook a few minutes, turning the potatoes and carrots over a few times. Add tomato paste and stir until the vegetables are coated, then add broth. 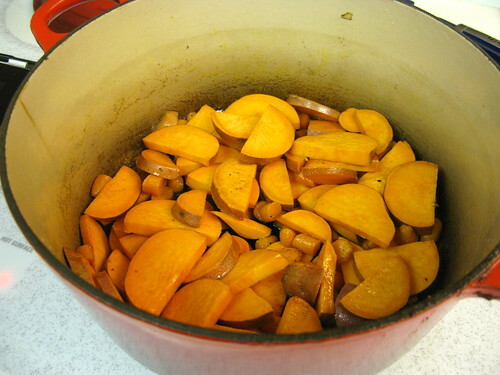 Bring to a simmer and cook until the sweet potatoes start to become tender. Add meatballs and simmer until the meatballs are cooked through. Sprinkle with cilantro just before serving. 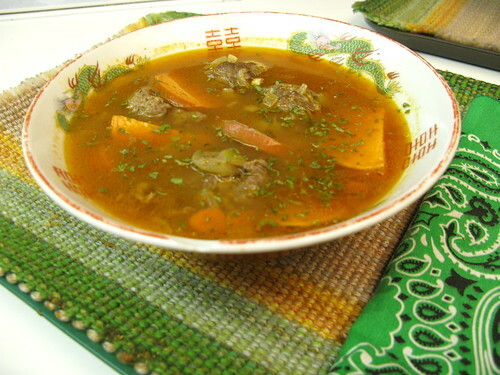 This is a stand-alone soup, a one-dish meal. Some recipes for Moroccan meatball soup call for it to be served over couscous, and probably have less broth than this version. I love soup but am kind of meh when it comes to couscous, so I like it this way, with crusty bread on the side. © 2013, Crouton deMenthe. All rights reserved.